The key to our approach, and what makes it unique, is that primary research is conducted on a regular basis with as many stakeholders as possible. With modern tools available, corporate governance and research need not be expensive, and indeed we have researched this ourselves to provide a few options, including free survey accounts with online providers. We believe conducting a stakeholder survey regularly is essential not only for good corporate governance but to ensure your goals are – and remain – acceptable and supported by at least the majority of stakeholders. It also allows you to open dialogue and gauge the opinion of ALL stakeholders – again, modern technology provides previously unavailable solutions to this. Clearly there will be a variety of views and a balance has to be struck between individual interests and the common good, especially the survival of the company. By implementing good corporate governance and research programmes, and communicating regularly with all groups, you can increase consensus and improve goal congruence – achieving as close to a common goal as is possible. The approach taken to corporate governance to date has focussed entirely on creating rules and regulations, a “stick” rather than “carrot” approach. Any externally enforced, or suggested, in the case of voluntary codes of conduct, will never be effective if the organisational culture is off. Clearly some rules are needed and the stick to enforce them – and demonstrating compliance with them as clearly has some benefit, at least in the case of voluntary codes. But how many customers actually buy because of membership of a professional association or compliance with a Corporate Governance Code (how many consumers have even heard of Sarbanes Oxley, the Combined Code or King)? Rather it will usually only appear on the radar if a company is NOT a member – why not? Avoiding negative publicity and sentiment is a benefit of sorts but, as with the mainstream corporate governance debate, is by definition a negative approach – except for the audit, accountancy and risk management companies, of course, who have made millions out of this new market. Even in the context of codes and compliance, corporate governance and research are intrinsically linked, of course. 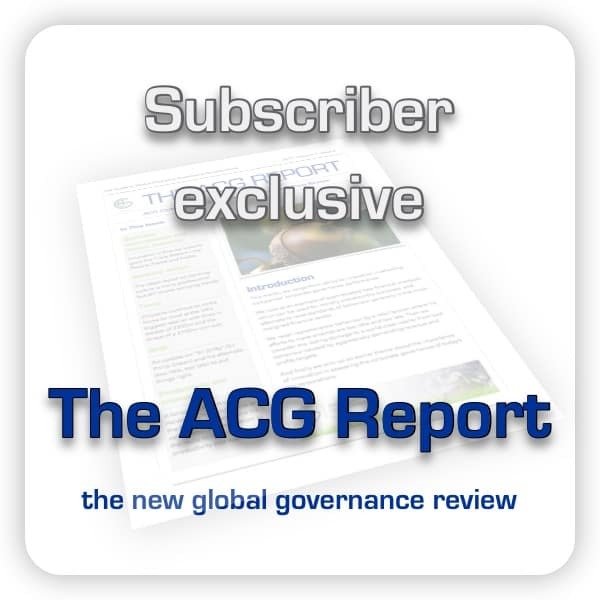 To assess an organisation’s governance effectively, you have to look beyond the annual report and accounts, and to assess and benchmark governance in a particular sector or country requires research. But if you are responsible for corporate governance compliance, how much research have you actually done to back up your claims. Ok, so most of this about box ticking and deliberately easily measurable – such as the number of non-executive or independent directors there should be on the board. It has been proven, time and time again, that this approach just does not work. Just because you make an activity illegal doesn’t stop it happening – that’s like saying making burglary illegal stops people breaking into houses. People need positive motivation to behave well and contribute positively to society. It is no co-incidence that social initiatives that deal with the root causes of poverty have a far more dramatic effect on crime than heavy handed policing, which simply worsens the problem through fuelling resentment of the very authority trying to protect society. Our view of corporate governance and research is a lot more positive than all this. Not only will you obtain a lot more in-depth knowledge of how well your organisation is complying with the spirit as well as the letter of the law and codes of conduct. You will gain so many other, perhaps unexpected benefits, albeit some are dressed up as problems to be solved! Better to be aware of a problem and understand the root cause, so you can solve it. Unique insights will inevitably come out of talking directly to stakeholders – especially if you appoint independent research organisations to do formal, qualitative and quantitative research into stakeholder views. In a sense this is all part of learning to live more consciously. Many organisations live in denial about the real culture driving them. The collapse of so many financial institutions following the so-called “Credit Crunch” in 2008 (with root causes well before of course), is surely proof of that. Indeed in all major corporate failures, the final collapse has happened at a shattering speed. Nefarious practices or plain excessive risk taking or incompetence have been hidden to such an extent that it takes a catastrophic event for it to surface and it is usually too late to save the business in remotely the form it in which it existed to that point (which was clearly unsustainable). So rather than look at corporate governance as a separate issue, with specific rules and regulations to enforce (the stick), why not take a fresh approach and focus on the positive benefits of being socially and environmentally responsible (the carrot). This is not new, of course, but until now, there has not been a clear way to monitor and measure these benefits. In our Applied Corporate Governance™ methodology, we have devised a complete, research-based system which does just that, placing corporate governance and research together for the first time. We originally published this methodology in one of our books – Real World Corporate Governance (FT Pitman, 1997). We will be publishing ebooks on this site based on an updated version of the methodology. In this section on corporate governance and research, we make the case for using primary research and discuss ways in which it can be used in practical ways, as part of or separately from a full good corporate governance implementation programme. At its simplest level, corporate governance and research can be implemented using a simple stakeholder survey, conducted regularly to gauge views on key governance issues. Click here for an example which follows our five Golden Rules of best corporate governance practice. While it is important to do occasional (but still regular) offline research to avoid missing key demographics and hence voices, this can be costly. By using online tools, you not only open up permanent, ongoing and two way communication with an increasingly large percentage of your stakeholders but allows cost effective, efficient management of the survey programming and data collection/processing. This can be particularly effective for conducting an internal stakeholder survey, assuming you employ mainly white collar staff (though use of strategically placed and suitably simple-to-use terminals can be equally effective). Online survey technology has moved on a lot in the last few years. We have done some homework for you and researched the best tools available – here are selection of providers of free online survey tools to use in your corporate governance and research programmes.